At the very outset, let me wish you all a very Happy New Year 2018. Every year we make a brand new beginning as the new year sets in. Everyone makes tall promises to change at the brink of New Year, but soon the reality of it dawns. Only calendar changes, not the person. 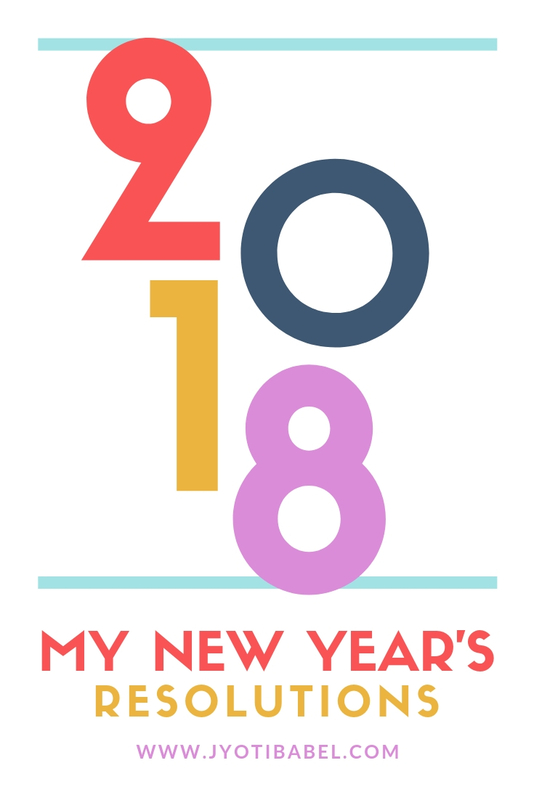 I have never documented my New Year resolutions on this blog, in all these years, so I thought to do it differently this year. And next year's words await another voice. And to make an end is to make a beginning." I do have a longish list of things I want to accomplish in the year 2018. Some of these are things I am already working on, and there are also some new projects I want to undertake. But, today I will share with you the 3 most important things to focus on this year. So, how am I going to make it work for me? I have always done things better when I have written them down, hence the idea to post it here. Writing things down works for me because it gives me a chance to remind myself of my goals, it pushes me to get things done, and also gives me the opportunity to recheck and reassess when needed. The only way to make it work in the long term is by making myself accountable for it. Don't you agree? So, let's get started with my New Year Resolutions 2018. This is the number one area of focus in most new year resolution lists. Mine is no different. There are many things that I need to change in my daily routine to move towards a healthier lifestyle. I have made efforts in this area this year as well, but I am not quite there yet. After much introspection, I realised that in order to really succeed in this area I have to follow the old age maxim - early to bed and early to rise. If I can join the 6 a.m.club, I am sure I will have the time for the things I need to do to move towards a better and healthier lifestyle. Brisk Walk for 1 hour every day (or at least 5 days a week). 30 minutes of meditation every day. Drink 2-3 litres of water every day. Get 8 hours of sleep every day. Okay. This bit is for the reader and writer in me. Ever since I joined the mommy club, my priorities changed drastically. Now that my LO is soon going to turn two and I am long done with my sleepless-nights phase, I need to shift the focus a little bit (if not all) on me. I have to learn to make time for myself if I don't want to feel burnt at the end of every day. On the reading front, my goals are clear and simple. I aim to read at least 2 books every month in 2018. I want to catch up on the blogs of my fellow bloggers (I have discovered so many amazing new blogs recently). And yes, I also want to write more, and more often. Anywhere between 6-8 posts a month for each of my blog will give me peace! This is actually a work-in-progress idea from last year. Somewhere in the second half of 2017, I came across a video on WhatsApp on the importance of decluttering and when I watched it, it made so much sense to me. In essence, the video gave the message that when we declutter our surroundings, we bid adieu to chaos and negative energy and make way for positive vibes. I went into a reassessment mode after I saw the video and realized that there were so many things in my house- in my wardrobe, in my kitchen, in my storage spaces, etc., that I have not used over a year. Anything that has not been used for a prolonged period is essentially ‘clutter’. There were clothes that did not fit me anymore; bottles and jars I thought I would use as food props and they kept piling up. There were books that were of no use to me and not to talk about the pile of documents that should have been shredded long ago, etc. Ever since we welcomed baby M into our lives, there has been an exponential increase in the baby items (gear, toys, etc.) in our house. A little more space in the house was more than welcome as it could go a long way in keeping things organized. So, I began my journey of decluttering. I have given away a lot of things that were of no use to me but were useful to others. The space this exercise has created inside my wardrobe, storage areas, and kitchen shelves have given them a breather. And strangely I feel so much lighter. There is still more to do in this area. In the year 2018, I don't just want to do declutter, but I want to go a step ahead. I want to avoid gathering more clutter. I am often an impulsive buyer and many a time I get things that I don't really need. Recently, I came across this article on My year of No shopping and wondered if I can follow suit. Maybe with a little bit of planning, I can. So, to test the waters, I will make a conscious effort to be more mindful of my purchases. Minimalism is one of my mantras to live by in 2018. That can save me money and much hassle later. A win-win deal. Isn't it? That's all for now on my new year resolutions 2018. I will love to hear your thoughts on New Year resolutions. Do they work for you? Or you do not believe in them. Whatever is your story, let me know about it by leaving a comment below.